I usually have a rule that I don’t buy tomatoes in the store. I wait for tomato season at the Farmer’s Market and in my garden, and I cherish the ones I’m able to freeze, can, or dry. But there is one kind of store tomato that ends up tempting me into letting it be the tasty exception to that seasonal rule. When I saw a box of bright red very ripe organic grape tomatoes for 30 percent off, I was putty in my own tomato-hungry hands. It had been cold and wintery for so long, and the tomato starts I featured in my last post in honor of my friend Eric hadn’t even popped up above the potting soil yet. Since it was still really too cold to eat a salad as my main course, I was thrilled to have the inspiration to pair them in a hot stir fry with more wintery veggies like cabbage and broccoli. I thought I would be making it just the few times it would take to empty the one little box of tomatoes, but it was so good I have been eating versions of it regularly for the last couple of months. Like my polenta soup, this lunch bowl is more of a strategy than a recipe, but I will happily detail my strategy for you in hopes that it will inspire you to a bright and happy Asian style lunch bowl of your own. All the ingredients are staples I almost always have on hand. Like my Tasty Colorful Kitchari Skillet Meal, it requires having some starches and beans already cooked, but then you’re all set to combine and create as you wish. 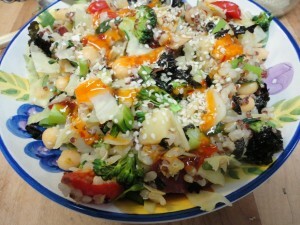 This lunch has a sweet and sour flair to it, without being too sweet or too salty or too processed. The truth is I eyeball all my quantities, so these measurements are my best guess, just to get you into the Asian bowl ballpark. Heat a couple tablespoons of water or broth from cooking the chickpeas in a non-stick skillet. When it starts to bubble, add the cabbage, broccoli, tomatoes and pineapple. Sprinkle liberally with garlic granules. Cover and let cook over medium heat for a couple of minutes. You can check to see if the veggies need more water or broth after about two minutes. Cover again if necessary and cook until the tomatoes are soft and the cabbage and broccoli are bright green. Add a little more water or broth if necessary, and then add the rice and quinoa, the sweet potato, the chickpeas and the ginger. Stir fry until everything is combined and warm. Turn off heat and cover for a minute while you chop your onion and tear up the nori sheet. Scoop the stir fry mixture into a big bowl and mix in the nori. Top with green onion, a swirl of Thai Sweet Red Chili Sauce and the teaspoon of sesame seeds. Eat it with a spoon so as not to miss a single bit of it. Notes: I cook 1 1/2 cups brown rice and 1/2 cup red quinoa together in 4 cups of water on the stovetop. I just put it all in a pot, bring to a boil, turn down to a simmer and let it cook for 30 minutes. Then I turn off the heat and let it sit, covered for another 10. Easy shmeezy. I don’t have a rice cooker, so I can’t give directions for that, but if you have one, you can try doing it in that. I like to bake my Japanese Sweet Potatoes. I prick them with a knife, and put them on a shallow dish or pan lined with baking parchment and bake at 425 for at least an hour, sometimes 70 minutes, if they are large. You can also cube and steam or boil them too. 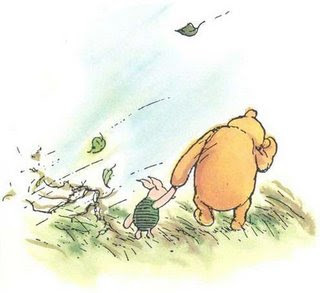 Spring is officially here, but there will still be many blustery days when Romeo and I feel like Pooh and Piglet on our morning walk, and a nice warm lunch is just what hits the spot. There will be many many more days before the little tiny tomatoes make their appearance at the Farmer’s Market here, and even more before I’ll know if I’m lucky enough this year to see some in my own garden. So while I’m watching my tomato plants grow and dreaming of the day they make it all the way to offering up their lovely fruits, I’ll brighten my cabbage with these little organic gems. I guess it was the apple–or the pomegranate–that tempted Eve–but for me, right now, it’s these little tiny tomatoes that have stolen my heart out of season into summer yet-to-come. Oooh that looks yummy, filling and refreshing to the eyes and palate all at once! Thanks, Nicole!! I bet you can come up with an equally stunning and appropriate version for yourself too! This sounds delicious! How spicy hot is the Thai chili sauce? Thank you, Karen, and welcome! The Thai Sweet Red Chili Sauce is more sweet than spicy hot–it’s basically sugar, water, pickled red chilis, rice vinegar and garlic, with some tapioca starch as thickener. Just a little does a lot! Sounds delicious! 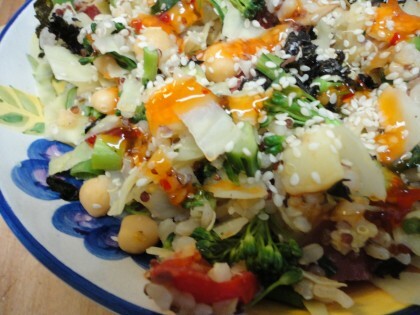 Chances are, I’ll be making your Asian bowl for dinner tonight! I might also stir in some roasted Brussels sprouts just to see how they work with red chili sauce. This looks so tasty!! And I love those little tomatoes, too – I can’t ignore them when I see them! I have to make more bowls; they’re so easy and so filling. And I love just about anything with Asian flavors! That sweet chili sauce is so yummy. Thanks Veronica! Glad to hear you are a fan of those little tomatoes too–they are pretty hard to ignore, aren’t they? 🙂 I am really a “bowl” person–I love easy and filling. 🙂 And yes, that Thai Sweet Chili Sauce is yummy!